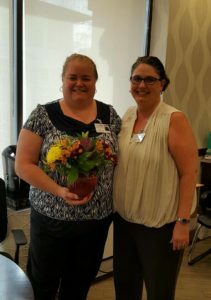 Welcoming Lynn McConnell, New Director of Nursing at Regency! Welcoming Lynn McConnell! Our new Director of Nursing at Regency Healthcare and Rehabilitation joined us earlier this month – and we are excited to have her on our Team! Pictured below: Lynn McConnell on the left with Terry O’Connell the administrator at Regency. ← Brookside Healthcare & Rehabilitation Center: Proud Sponsor of the 6th Annual “Outrunning Senior Hunger” and the 5K Run/3K Walk for Meals On Wheels!